DIY seed starter pots are a great project to save you some cash – which you can spend on seeds to put in your DIY seed starter pots! Most of these are easy enough for smaller kids to help to, should you have some you’d like to involve in a project. My goal in this post is to show you not only how many different ways you can start your seeds, but how to use materials you already have; save cash, landfills, etc. I say try them all and see which works the best for your particular needs. What is a seed starter and why use them? A seed starter pot is simple a starting place for your seeds to begin life before you transplant them into your garden. It is a great way to get a jump start on your garden, especially if you live in harsh weather conditions (very cold or very hot). This way you can start your vegetables in “perfect” conditions indoors, in a greenhouse or sometimes on a porch. I have used them because I want to be able to pick from the strongest, healthiest sprouts so every inch of my garden is filled with the best of the best. If I have more than I can use then I bring them to the garden exchange, give them to friends and occasionally I can sell them. Eggs shells are a natural seed starter pot. Sure I love to put in in compost, use them around the garden and even feed them back to my laying hens for extra nutrients (see How to Reuse Egg Shells), But we generally have enough to use some a seed starters for our garden. Some people like to only take off a bit of the shell’s top when cracking their egg, leaving more space for dirt and eventually roots; while others crack the egg in half so there are 2 starter pots. The only thing you need to do to use an egg shell as a DIY seed starter is to make a small hole for drainage. The great thing about egg shells is that you can plant them directly into your garden; the roots will eventually break through th shell as the grow the the shell will biodegrade and feed the soil. Great video tutorial on making your egg shell seed start pots. Of course I recommend you use egg shells from healthy, organically raised chickens. If you’re going to use egg cartons as one of your DIY seed starter pots then I suggest only using cardboard (no Styrofoam). If you don’t buy eggs you can ask your non-homesteading friends to save their cardboard cartons for you. 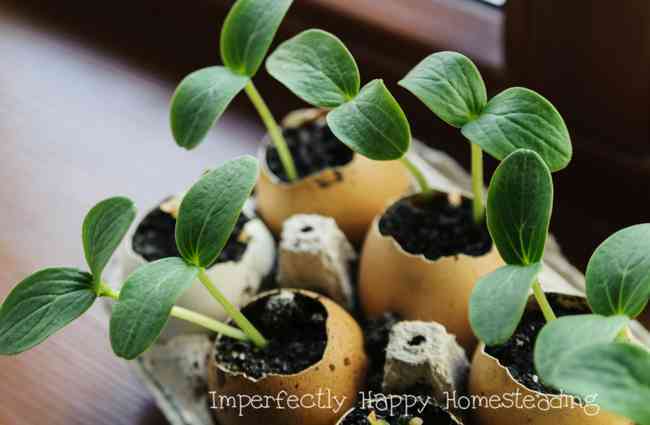 An egg carton gives you a flat surface to start 12 little seedlings; but best for ones that you are going to plant as a small sprout because they don’t have a lot of room to grow. When you’re ready to plant in your garden, simply cut the sections apart and plant directly; you do not need to remove the cardboard as it will decompose. I don’t use a lot of paper towels but we do keep them handy for the occasional job that I don’t want to use my Norwex clothes for (aka poop). But most of us will have an abundance of tp rolls (they can be ripped up and put in your compost too if they aren’t scented). 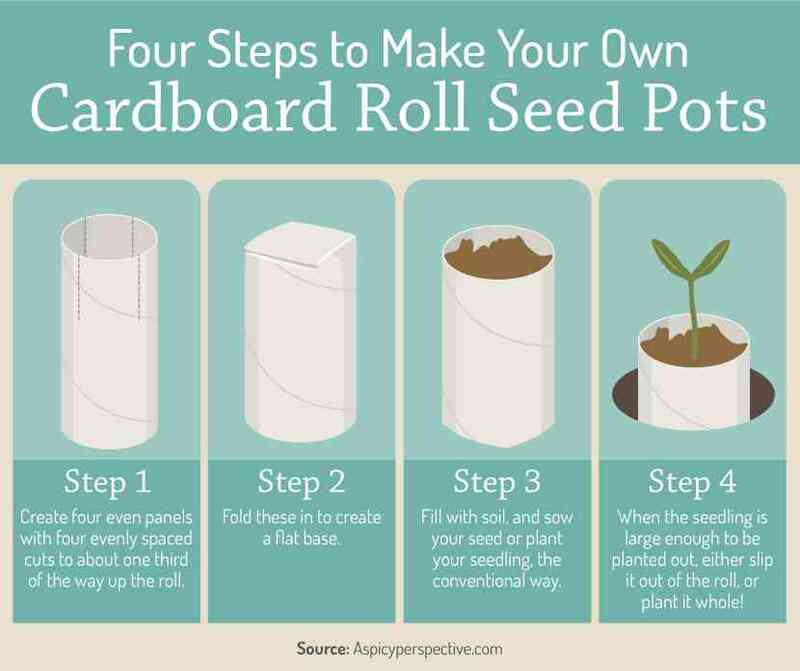 By making a few cuts and folds you’ll have a free DIY Seed Start Pot that, again, can be planted directly into your soil. The awesome thing is that these babies can be made so that your seedlings can grow a bit more roots before sending them outside. Do you have yogurt containers? What about plastic cups? Sour cream containers? Milk jugs? These can all be converted into seed starter pots with a few drainage holes. Sure you won’t be able to plant these but it is a great way to reuse something before you send it off to be recycled. So the next time you’re at a party where the host is throwing away plastic cups and containers…offer to rinse them out and take them home! Newspapers are great material for making DIY seed starter pots. You have a couple of choices in your designs too. For small pots you can use a potager tool to help you make your seedling pots – it will take a few tries before you perfect the use but don’t give up. Or if you’d like to make bigger newspaper pots check out this tutorial. One note, these are newspaper and won’t hold up long, so keep that in mind. How about skipping a pot altogether and making blocks of soil to plant your seeds in? These are great because you don’t have to wonder or worry about the container you plant in the soil…because there isn’t one! You can make a one-time investment into a soil block builder, like this one; which isn’t bad since you’ll be using it for years to come. Or you can make your own soil block maker by recycling a container you already have around the house. Instructables has a great tutorial for this! Well there you have it, 6 free or nearly free ways to make DIY seed starter pots. Now let’s get to gardening!